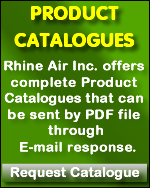 Rhine Air Inc. has specialized in the design and manufacture of Aircraft Fuel Tank Ventilation and Respiratory Protection Equipment for over 30 years. Our approach to product design has always involved customer input and product field test evaluation.Our company mission is to provide the most portable equipment possible that is (1) Easy to understand, set up and use (2) Extremely safe (3) Features superior performance and (4) Offers increased versatility to adapt to various airframe designs and work locations.Rhine Air systems can be used at fixed base maintenance locations or at remote AOG sites. Equipment is designed to store and transport with a minimum of effort. Major Aircraft Manufacturers, prominent Aircraft Maintenance Companies and Worldwide Military activities currently use or recommend these systems. We believe through proven experience there is a fundamental design advantage with our products that will enhance worker safety as well as provide faster preparation for your Fuel Tank Entry program. Used Equipment Notification: Due to unknown history of equipment use and maintenance associated with previous ownership which may compromise operational integrity and safety, Rhine Air will not certify, logistically support or be liable for previously used products sold, donated, auctioned or purchased without our written consent or approval.